While juicy and sweet, the peach is not often associated with tropical symbolism like its equally juicy and sweet counterpart the pineapple, and its tropical relative the coconut. Well, Frank’s never let cliches and stereotypes get in the way of his baking. The Peach is tropical in all but the social imagination and that not for long. 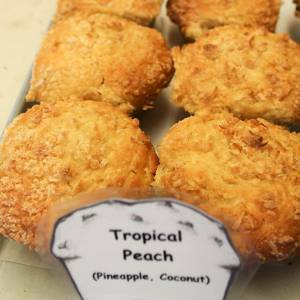 Here with this Tropical Peach muffin he’s out not just to improve baking, but to innovate the very core of our worldly perceptions.